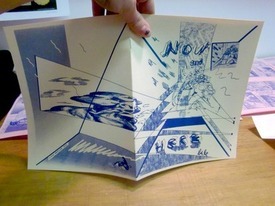 Now and Here is a 16-page risograph with a wraparound cover, printed in blue on pink interior pages and cream cardstock for the cover. The approach to comics on display in Now and Here provides evidence that Westvind is refining her sensibility and honing in on some specifics. Her loose, angular artwork here might put some readers in mind of Yuichii Yokoyama, who wouldn’t be wrong to relate the two creators. The concerns of the narrative – such as it is – can also be seen to inhabit the neighborhood of Ron Regé, Jr. and Theo Ellsworth in its persistent questioning and exploring of the nature of consciousness and the perception of time. A stronger sense of frustration pervades the pages, however, and there an is almost antagonistic quality to its prodding of reality’s cage. As have countless others before her, Westvind has created a “fantastic realm” of the imagination here – a psychic space within which to confront her frustration with the quotidian. It is one that shares some structural similarities with the multiverses of superhero™ comics (such as The Marvel Universe™), yet hers is clearly personal. Her comics precursors are more underground that mainstream – in as much as the remnants of attachment to specific fantasy are fetishes of the motorcycle outlaw and high-heels – and have been finely filtered to strain out as much as possible of extraneous attachment to contemporary popular power fantasies; in both script and art her approach is concerned with creating new and personal abstractions that share little with those typically found in comics that operate in this realm. With its staccato narration and total absence of dialogue, an entirely interior space is created that communicates the struggle of reaching towards an intentional agency in a world of dictated consequences.